The two low-slung industrial properties at 590 and 600 Minnesota Street, on either side of 18th Street in Dogpatch, are on the market and zoned for Urban Mixed Use development, which includes housing, up to 58-feet in height. And while a deal has yet to be inked, UCSF is rumored to be looking at the site for the development of “over 1,000 student housing units,” according to the Chronicle. Great news, I know that many graduate students are without subsidized housing right now, and this will certainly hurt enrollment. 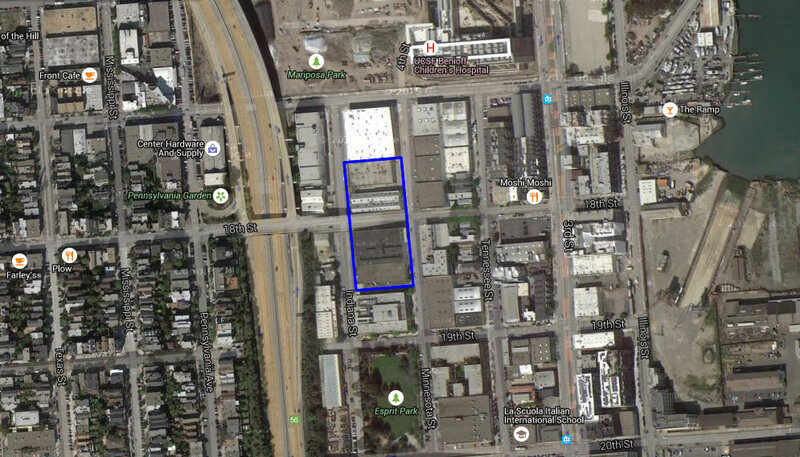 Ideally UCSF could switch this lot with one of the lots in Mission Bay allocated for very low income housing (e.g. blocks 6, 7). To be frank, I don’t think low income residents necessarily need to be put up in prime real estate right next to UCSF. Well it’s a good thing you’re not making these planning decisions now isn’t it! Mission Bay was intended (with varied success) to be an actual neighborhood with varied uses, incomes and demographics, not just a campus for UCSF. The notion that vets and working class families (Mission Bay Housing For Homeless Vets And Low-Income Families) aren’t worthy of “prime real estate” is pretty insulting. That view from the top of Sutro Tower is a fairly long view and pertinent. However, the Mission Bay plan has evolved over time. At one point it was suppose to provide for a biotech hub, now we have other uses including a sports venue. Cities have arranged themselves based on zoning of land, based on a general plan, heck but things change. I know that three decades from now Mission Bay land use may look similar but will certainly change. I relate to your approval of housing homeless veterans. Moreover, the family housing initiative (ill children at UCSF) and others are really constructive. However, I do not agree subsidizing randomly selected low income or mid-income (in the case of BMRs) is reasonable. These housing initiatives will occur in blocks 6, 7. The cost is literally hundreds of millions of dollars to assist people who absolutely do not need it – – they are perfectly capable of commuting from other parts of the bay area (yes, Richmond is still affordable). The abstract goal of achieving “diverse” neighborhoods is self-righteous and an arbitrary use a tremendous amount of money. the populist politicians benefit, however, as they now have an entrenched set of voters. You’re numbers (to the extent they are even relevant ) are as faulty (hundreds of millions of dollars?) as your person is loathsome. Take, for example, a BMR condo building. Typical two-bedroom has a market value of $1 million. The lottery winner pays $200,000, and after 25 years becomes unrestricted owner. Obviously a net transfer of $800,000. For a building of 120 units, clearly a $100 million subsidy. For rentals, someone pays $800 for a two bedroom that rents for $4000 market rate. Lottery winners are entitled to 25 years. Net subsidy of about $40,000 a year, over 25 years is about $1 million per unit. Let me be more precise: such policies amount to subsidies of hundreds of millions of dollars in subsidies over the next 25 years. And what does this achieve? Can you really say that the money would not be better used by applying to infrastructure improvements? How about others who are truly in need (no, not having to commute from Vallejo)? You should really challenge yourself to make an intelligent argument in support of such policies. Do the resale restrictions on BMR units expire after 25 years? Aren’t they actually indefinite and any resale has to be priced according to a formula based on median income and not market rate and any buyer has to come from an income restricted pool? As if we don’t make societal choices to “subsidize” peoples’ choices much less needs. Most notable the huge amounts expended on transportation (especially highways for private vehicular traffic) subsidizing wealthy suburbanites’ decisions to live far removed from where they make their handsome incomes. I’m just as comfortable with the use of private and public resources being applied towards providing for housing needs for our city’s residents abating the effects of pure market forces. Isn’t UCSF also converting a lot of their Parnassus campus buildings into housing (or back into housing, depending on the specific buildings)? What’s the time frame for that? I totally agree, lack of student housing would really hurt enrollment. Article about UCSF’s planned housing changes on Parnassus. UCSF badly needs this. They are having difficulty getting the most talented graduate students to move out here because of the high cost of renting. The City may be a bit peeved as Mission Bay is going to have an even larger percentage of the Mission Bay neighborhood not producing property taxes. I wonder how many landlords knew how much it would matter having their parcels zoned UMU vs. PDR. Judging by the number of applications the planning department had to process under their office legitimization program, I don’t think they did. It’s definitely a lesson for anyone who owns or leases anything other than a SFH in the city. This would be awesome for 18th St. on Pot Hill. Obviously, the resident NIMBYs are gonna be kicking and screaming about all these “rich kids” and the fancy degrees they’re trying to get, but the rest of us will enjoy the variety of cafes, bars, grocery stores, etc. catering to a relatively young and health-oriented clientele. Or perhaps we could have residential development on these blocks that provide more permanent residents to the neighborhood (and the retail to support it). I hate to break it to you, but those med school kids and residents don’t have a ton of free time to frequent the neighborhood haunts. Don’t you ever get tired of being so predictable? Btw, there is Daggett Place, 1601 Mariposa, and at least 2 more projects in the works along 16th St. Those are intended for “more permanent residents”. Now, please remind us what the “Booster” position is or has been on all those projects. The position has been that the City needs to provide adequate infrastructure to support the new residents that will live there, and that the developers should include neighborhood serving amenities (retail space, open space, community space) to mitigate their impacts. Those efforts have been positive, as with the park that came out of Daggett. Your labeling of anyone with a criticism, however small, of a housing project in Potrero/Dogpatch as a NIMBY is what’s predictable here. This is not black and white; and just because someone says something critical about the first design of a project that appears on Socketsite, it does not mean they want the neighborhood to revert back to 1992 form and never change. Are you a developer? Your responses make it seem that asking for setbacks or ground floor retail actually harms you in some way. The agreements that brought Dogpatch to Mission Bay included that UCSF would stick to Mission Bay. This is in part because the University does not pay property taxes. So we planned to give up some land that could generate property tax for the economic benefit that use would bring. It’s a reasonable question to ask if its appropriate for UCSF to encroach into Dogpatch, or whether they should be required to stick to Mission Bay. It’s not “we have to build this here or we can build no housing for our students.” It’s a negotiation about what this project actually is, and what’s best for the neighborhood around it. It would be great if you’d actually participate in that conversation. But, given your screen name, I guess you’re just too busy. That’s a nice story. It’s also total BS. I’ve been to more than enough community meetings in this neighborhood and I’m very familiar with the MO of the Boosters, GPR, and the various ad hoc NIMBY groups. Petitioning the city for infrastructure or service enhancements is a fallback position after all the obstructionist behavior has failed. First position is always – ALWAYS – to categorically oppose the project. Then it’s usually to get it scaled back because “the density is out of scale with the neighborhood character”. Then it’s some other asanine thing just to delay the whole process, like an extended EIR or contaminated soil. The Boosters were boasting about chasing Kaiser across 280 to Mission Bay. And for what? Views! No mention of enhanced infrastructure on that one. And what have you accomplished? Better infrastructure? Better parking? Better law enforcement? Jackson Park as a real neighborhood park? No, absolutely nothing of value to the existing residents you claim to represent. You clearly have no clue what you are talking about. The Boosters have not categorically opposed any project, and have been formally supportive of some. I am sorry if you had a bad experience in the past. I mean, the Boosters helped develop the Eastern Neighborhoods Plan. Unfortunately, it’s implementation included no enforceability to the transit and green space components of the plan. And the Boosters did not chase Kaiser across 280; here is the story: http://www.potreroview.net/news11031.html. The Boosters did have a forum to allow residents air their views on the initial proposal, both pro and con. But facts are such pernicious things. Not easy to tell who represents whom when the shouting match begins at those meetings, and there’s a lot of overlapping membership between the different groups. But if the Boosters intend to be the voice of reason – and thus in opposition to GPR and Save the Hill – then you are completely failing at getting that message across. When the official position of GPR on 1601 Mariposa was that the city should buy the site, clean it up and maintain it as open space, I didn’t hear anyone from the Boosters object to that. Did you? If so, in what forum? Just as an example. Where are the window signs that say “DON’T stop 1601, but make it better”? Where and how are the Boosters intervening to stop the current stalling tactics? Clearly you don’t understand that there are residents who are sick of looking at vacant lots and industrial blight in their own neighborhood. That’s why you resort to the insinuation that I must be a developer. All par for the course. Booster – as a 4th gen SF’er I have to say I completely disagree with you. Retail space, fine all the other ridiculous stuff – NO. Your quote “(retail space, open space, community space) to mitigate their impacts. ” RUFKM? “COMMUNITY SPACE”? Pay for community space with your own money, not ours. @Formidable – I just looked up the Boosters and investigated them. They’re run by Tony Kelly (easily googlable, not outing anyone here), and it’s probably TK who is posting here, since he’s the “president”. Just check Tony’s fb page, he’s to the left of Mao/Stalin/Campos and is opposed to all development. He’s no “booster” for SF in the least. 1) I don’t run the Potrero Boosters. I was recently elected to be their 1st Vice President, but I wasn’t even on their executive committee in the last two years. 2) This is my first post at SocketSite ever (IIRC – If I have ever posted here before, it was years ago). I’m happy to post under my own name. 3) No idea who Booster is. 5) But hey, if posting anonymously and calling names is your way of discussing land use, go ahead! I won’t be getting into the habit of posting here. Feel free to contact me directly if you actually want to hear my thoughts. tonykelly@astound.net. All best wishes all around. Never posted here before, but just happened to read this thread where you were called out? What serendipity. I was told about the thread. And I read the site once in a while, but don’t bother posting. Enjoy your day. Med school students don’t frequent their neighborhood? What a ridiculous statement from somebody who must have never been to Irving Street in the Inner Sunset. Only the most hardened NIMBY could be against this. First, it’s got to be very difficult for the majority of students to pay for their housing in this city. Second, that amount of people competing for housing has to have a substantial impact upon the cost of housing for all. And, this is a 5 minute walk from campus which greatly alleviates transit concerns. This is excellent. UCSF does amazing health/dental, etc for everyone. This improves everyone’s lives when we are able to house our future medical professionals. Vacant lots are indeed a blight. 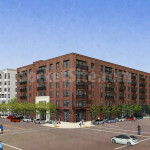 But the voice of reason may not be to accept a development just as it’s initially proposed. We’ve been working hard to make 1601 Mariposa a better project, and if and when it’s built, it won’t be better because of the knee-jerk support expressed by many on this blog. The fact that the building of 1601 Mariposa is still an “if” after the years of back and forth is ridiculous and sad. I hope the people that have opposed it all these years have been enjoying their unobstructed view of the beautiful pre-fab warehouses and parked buses at the site along with their extra daily 5 minutes of direct sunlight. UCSF students and faculty as well as our city are in the midst of a housing crisis. I welcome this project to my neighborhood with open arms. You can’t just throw those empty slogans around. How has 1601 Mariposa been improved by your obstructionism? And you still haven’t explained how you differ from the NIMBY groups like GPR and Save the Hill. These parcels are underutilized. Student housing is usually affordable by definition. More affordable housing in City with $4000+ avg monthly rents would be a very good thing.